David Hume (7 May 1711 – 25 August 1776) was a philosopher and historian from Scotland. When he was still alive, people thought of him as a historian. He wrote a series of large books called The History of England. But today, people think of Hume as an important philosopher. 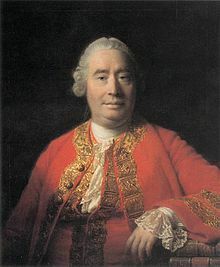 In his books on philosophy, Hume said that many of our beliefs do not come from reason. Instead, they come from our instincts or feelings. For example, reason does not tell us that one thing causes another. Instead, we see one thing and then we see another, and we feel a link between the two. Similarly, reason does not tell us that someone is a good person. Instead, we see that the person is kind and friendly, and we feel a special moral feeling. Because Hume thought that these beliefs do not come from reason, people call him a "skeptical" or "anti-rationalist" philosopher. Hume is famous for his 'Induction Fallacy'. This draws attention to a common mistake people make. People see something, and make claims that what they see will always be as they see it. For example, people see only white swans and claim that all swans are white. This is 'fallacious' or mistaken, because it is always possible that they then will see a black swan. Hume was also skeptical about religion. He was not a religious person and religious people did not like his opinions. He did not believe in miracles. He said that suicide wasn't always wrong, but never said whether or not he believed in God. In 1776, when he was dying, his friends found him very calm about death, despite him not believing in an Afterlife. Today, Hume's books are very important to philosophers who are interested in religion. Today's philosophers sometimes use the term 'Hume's fork' to refer to Hume calling everything we can think about either a relation of ideas (things like mathematics, that must be true) or a matter of fact (like science, where we have to look at things to tell whether or not they are true). Another philosopher, Immanuel Kant, read some of Hume's books and changed his mind about some important things. Kant said Hume had made him wake up from a sleeping dogmatism, the traditional metaphysics. Statue of David Hume, in Edinburgh, Scotland. In this large book, Hume talks about the human mind and tries to figure out how it works. He talks about knowledge, cause and effect, emotions, right and wrong, and many other things. In this small book, Hume talks about many of the same things from the Treatise, like knowledge and cause and effect. He tried to make this book easy to read. This is another small book, and again, Hume tried to make it easy to read. The book is about right and wrong. In this book, Hume has three characters who argue with each other about God. ↑ 1.0 1.1 1.2 1.3 1.4 Gay, Peter (1966). "In Search Of An Ideal Society". Age of Enlightenment. Time. Time-Life Books. p. 53. ↑ Rasmussen, Dennis. "He died as he lived: David Hume, philosopher and infidel". Aeon. Retrieved 22 June 2018. This page was last changed on 17 January 2019, at 23:36.